What could be more fun than an outdoor movie night? A DRIVE-IN!! 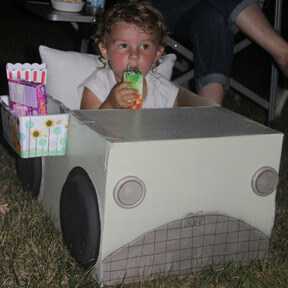 I created these fun little cars out of cardboard boxes so the kids had a comfy place to enjoy their movie! This is one of the coolest ideas I have ever seen! 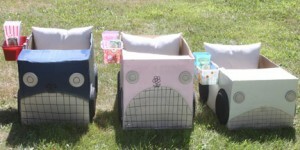 I was planning an outdoor movie night for a camping weekend and had already completed the outdoor screen when I stumbled upon this very cool tutorial on how to make little cars! I was so excited to make these, they were done within hours! 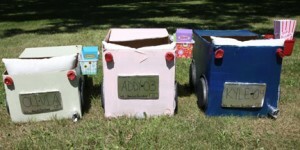 Cardboard boxes that your child will fit in, but isn’t so big that they can’t see out! I only did a couple things differently from the other tutorial. I left one of the flaps on the boxes and just taped it in place to make the dash board. I also had some diaper containers that were really cute, so I didn’t need to paint them. I personalized each car for each child, keeping in mind what they would get excited about. I used an outdoor pillow as a backrest and a chair cushion for them to sit on. They were so comfy, and didn’t move through the whole movie! 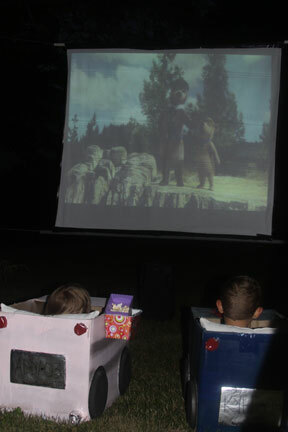 The handy snack holders were perfect and they had just enough room in their cars to enjoy the movie with their favorite blankie and stuffed animal friend!